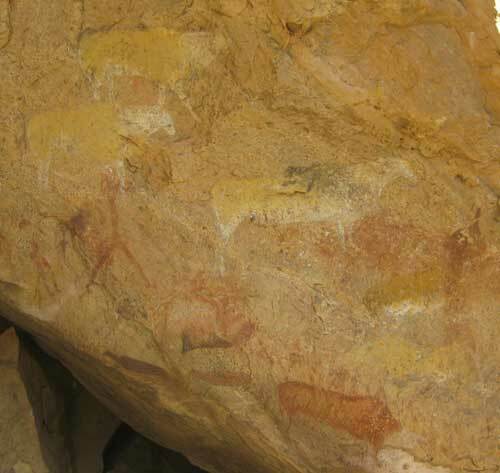 A San rock art panel at Main Cave in the central Drakensberg Mountains, South Africa. The rock art of southern Africa holds a special interest as most of it was done by an ancient people known by various linguistically derived terms such as the San or Khoisan (Khoe-san), !Kung, /Xam; or simply, in English, as the Bushmen. They were the aboriginal peoples of southern Africa and DNA studies have linked them to the earliest modern humans. Their images are looked to for insights into the very origin of art. This is a big subject with a complex history. Even the briefest summary is beyond the scope of this page. For example, one of the most vigorous archaeological debates of recent times has been over the role of shamanistic trance as the motivating activity for art. Its proponents based their case on mainly southern African ethnographic sources, but few now grant it as any more than one activity, and not the dominant one, in causing the production of art (Parkington et al 2008). 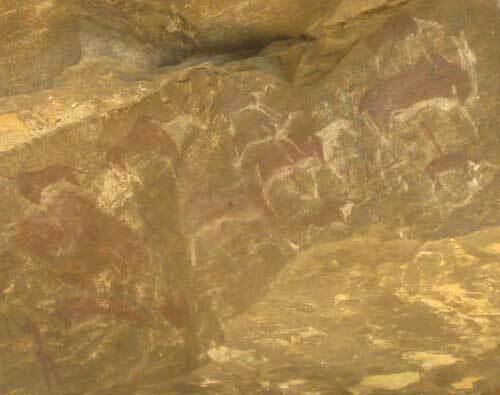 Rock art in southern Africa, and indeed around the world, is a subject of growing interest. The International Federation of Rock Art Organisations (IFRAO) is the peak body for a large number of national organisations devoted to rock art research, and papers are published regularly in scholarly journals. There are special interest books; conferences and seminars are attracting burgeoning numbers of delegates who regard the subject as a new branch of science. 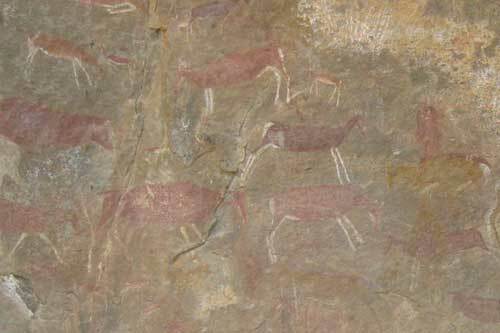 There is a rich heritage of rock art throughout southern Africa. Much of it is either not accessible to the public or may require days of hiking to get to it. What follows here is essentially a tourist sampling of the riches. Determination of the age of rock art is one of the most difficult and contentious issues in this emerging science. Most of the extant southern African rock art is thought to be of Holocene age, i.e. less than 10,000 ears old, perhaps only a few thousand years old, and much of it no more than several hundred years old. However there is southern African rock art dated to at least 70,000 years old (Thackeray 2005), which may put it close to the time modern humans spread out of Africa depending what theory about that history you accept. 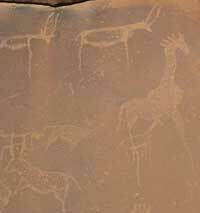 Rock art comes in two main forms: engravings called petroglyphs where material is removed from the rock surface by processes such as percussion and abrasion, and paintings where wet material is added to the rock surface by fingers or a type of brush. (There is also mobiliary art - sculpted portable objects.) Both are highly vulnerable to weathering, depending on the techniques used, the rock type, the local climate and other factors. 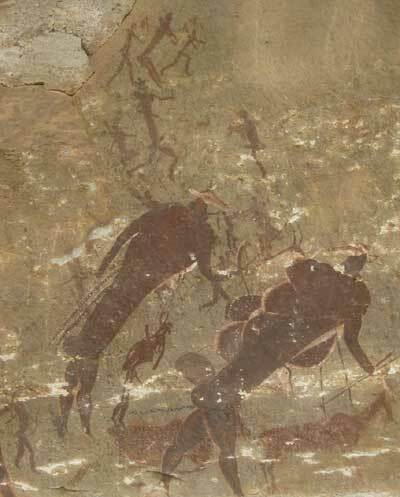 Rock art is often found in caves and on the walls under rock overhangs simply because that is where it is best preserved, not necessarily because they are preferred gallery sites (but there is the 'What to do on a rainy day?' hypothesis). Unfortunately it is not only the weather from which rock art needs to be preserved. The relentless spread of settlement and industrial development are potentially even more destructive. 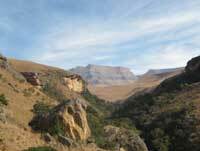 (Right) In the Drakensberg Mountains, Lesotho. The white patches in the gullies are ice of frozen streams. Not even this harsh landscape could save the Bushmen artists. 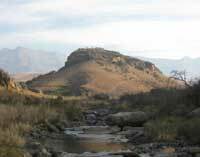 In the grim history of colonialism one of the most poignant stories one might ever read is that of the last known San artist in the mountains of Lesotho, then known as Basutoland. 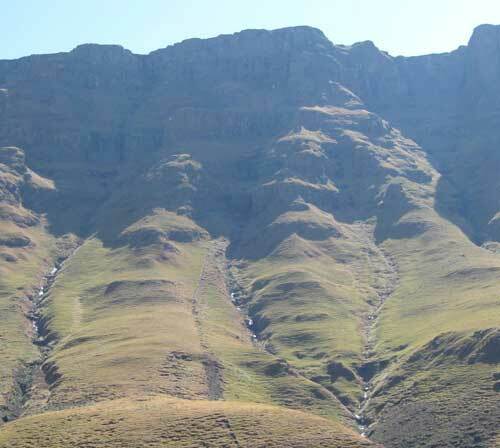 In the 1860s the surviving members of the San tribes in the region had fled to the Maluti Mountains, high on the plateau east of the Drakensbergs, a refuge of last resort. The painter was shot dead in a raid by settlers. They found him with a belt around his waist, to which were attached ten little horn pots, each containing a strikingly different coloured paint (Stow 1905; pp. 228-230). Paintings are much more common than engravings and are mainly found in caves and rock overhangs (usually sandstone), in mountain refuges. 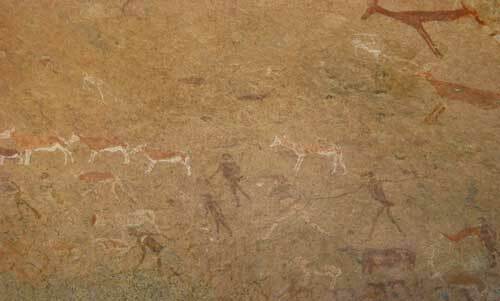 The bushman artists liked to depict animals as well as anthropomorphic figures. Among animals they favoured the large antelope species, particularly the eland, which was central to their culture, as shown in the four paintings below right. ...a rock art panel featuring a famous shaman figure. The figure above the striding shaman is a therianthrope; it has the head and horns of a gemsbok (antelope) and human rear legs. ...where much of the surviving San rock art is found on a geological formation known as Cave Sandstone. ... a great walking trail brings you to the San rock art at Main Cave. 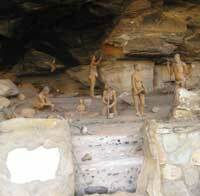 At Main Cave rock art site a diorama shows a San living area with the cross-section of an archaeological excavation. Looking back to the cave along Bushman's Creek. 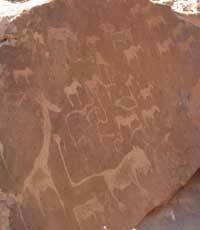 Petroglyphs are usually hardier than paintings, by their nature. It is harder to determine their age too. The examples here are all out in more or less open country. 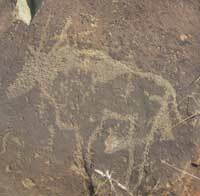 At Wildebeest Kuil Rock Art Centre, Kimberley, South Africa; an eland in the middle image. 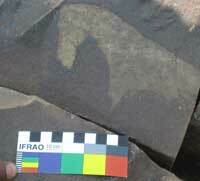 The card is the IFRAO Standard Scale used in rock art science to calibrate size and colour. This is the northern edge of the region called the Karoo, a /Xam San word referring to the aridity. Petroglyphs here are found, typically, on boulders around kopjes, small rises formed by volcanic rocks (dolerite and andesite) in flat to undulating country, enabling a lookout. 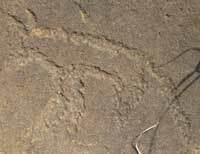 Parkington J, Morris D and Rusch N (2008) Karoo rock engravings. 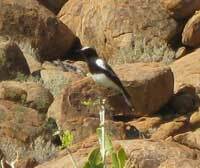 Krakadouw Trust, Clanwilliam, South Africa. Stow GW (1905) Native Races of South Africa. London: Swan, Sonnenschein. (Stow's account of the last Maluti painter was repeated in J. Desmond Clark The Prehistory of Southern Africa (Penguin, 1959), and Laurens van der Post The Lost World of the Kalahari (Readers Book Club in association with the Companion Book Club, London, 1961). Text and photos © Copyright Craig Robertson, 2010-2015, except where otherwise attributed. The images of rock art reproduced here of course belong to their long gone creators, and their existing descendents.